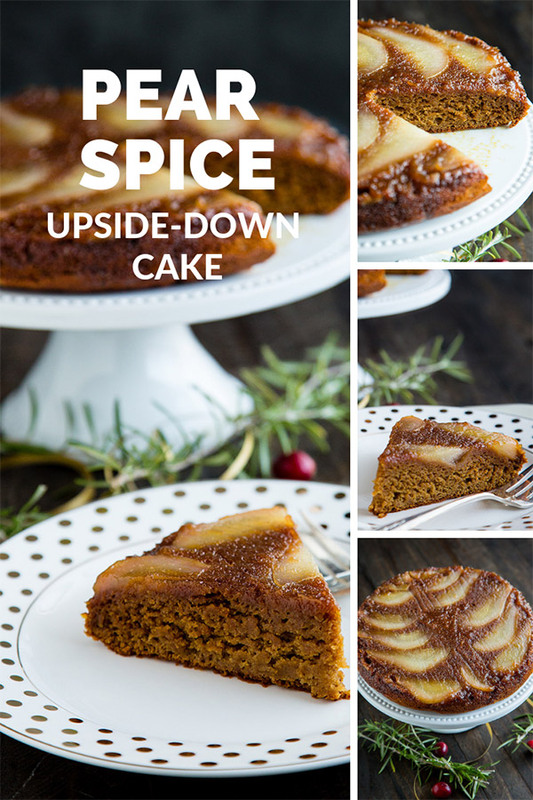 I fell in love with the looks of a Pear and Almond Upside Down Cake that someone shared in one of the groups I belong to on Facebook. 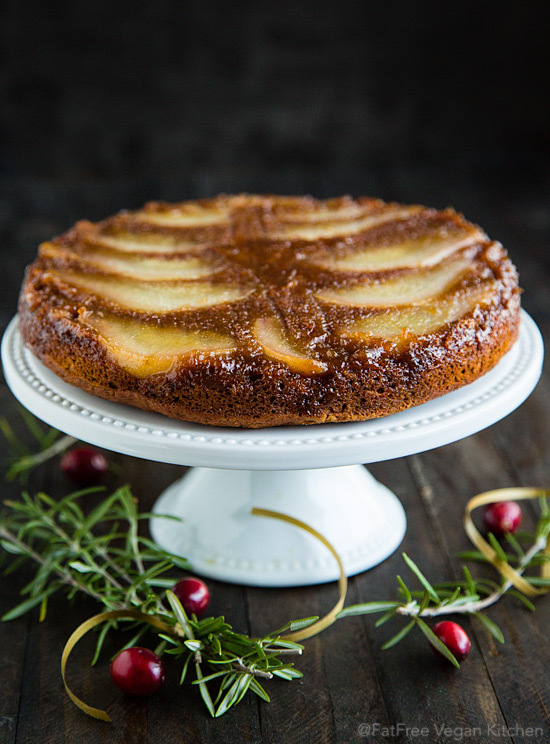 I loved the pattern the pears made on the top of the cake, so I decided to try to make my own version with a design somewhat in the shape of a Christmas tree…or the leaf design on a cup of soy latte. My husband, who doesn’t like pears, loved it. It’s incredibly moist and has just the right touch of spiciness. Pears are a little grittier than apples, so there’s a slight hint of crunch to the texture, but I think it adds something, makes it seem almost sugary. Between the two of us, we ate half the cake in one night, but we’re saving the rest for E, who gets home from college late tonight. 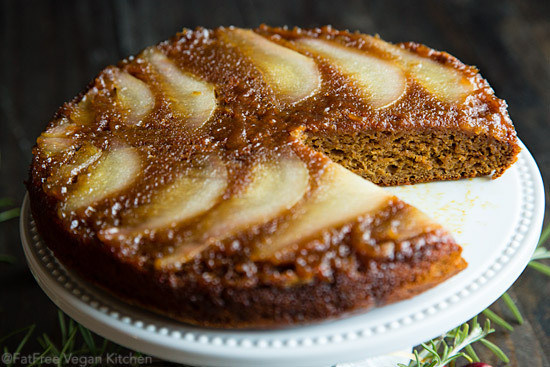 So be careful: This fat-free, refined sugar-free, whole wheat cake may entice you to eat much more than you intended. Be sure to set aside a slice for someone you love. 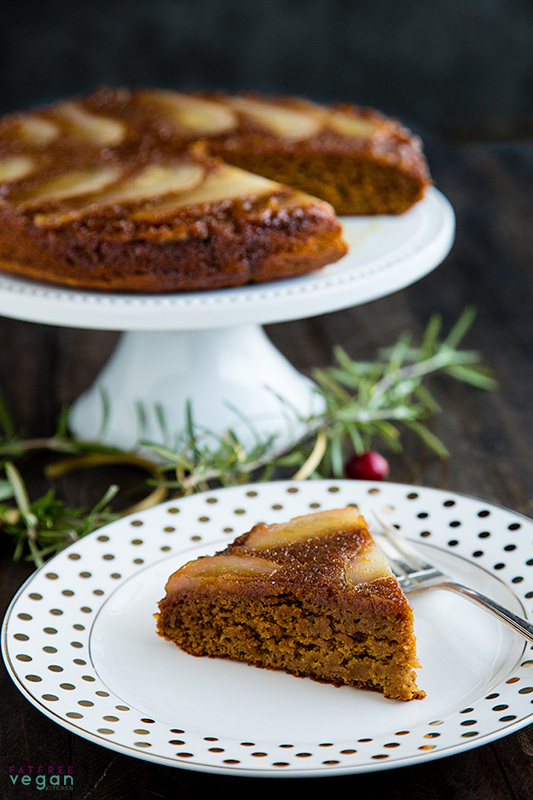 You will not believe that this richly spiced cake has no oil or nuts and is sweetened only with maple syrup. Since good maple syrup is expensive, feel free to replace part of it with agave nectar or your favorite liquid sweetener. Preheat oven to 350. Line the bottom of a 9-inch round non-stick baking pan with parchment paper cut to fit. In a medium mixing bowl, combine the dry ingredients and stir well. Set aside. Peel the pears. Cut one of them into thin slices about 1/4-inch thick (avoiding the core). Chop the other two into large chunks (again, no core). Arrange the sliced pear in the prepared pan in any design you wish. Don't worry about using all the slices--just as many as will fit or fit your idea of the design. Pour 1/4 cup of the maple syrup over the pears. Reserve the rest. Put the extra slices and the pear chunks into the blender with 2 tablespoons water. Blend, stopping if necessary to push down any stray pears, until it's about the consistency of applesauce. Measure out 1 2/3 cups of the pear sauce. Reserve any extra for another use (it's good on a fruit salad or in a smoothie). If there's not enough, add applesauce until you have 1 2/3 cups. Make a well in the dry ingredients and pour in the 1 2/3 cups of pear sauce. Add the remaining 1/2 cup of maple syrup and the other liquid ingredients. Stir until combined but don't over-stir. Carefully spoon the batter over the pears so that you don't move them and change the design. Bake for 35-45 minutes, testing by inserting a toothpick in the middle. It's ready when the toothpick comes out clean. Run a knife around the edge of the pan to loosen any stuck on parts of the cake. Place a serving dish over it and invert. Tap lightly to dislodge the cake from the pan. Loosen all the edges of the parchment paper and then slowly peel it back, using a knife or your fingers to push back into place any pieces of pear that want to stick to it. 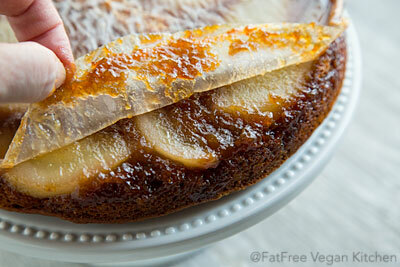 If there is glaze left on the paper, scrape it off with a knife and smooth it onto the cake. Allow to cool. Cut into 8 slices and enjoy! Note that the maple syrup is divided--1/4 cup is poured over the pears but the rest is mixed into the batter. Hi Susan, just wanted to say that I am enjoying your recipes especially the pumpkin spiced bread. Made it 3 times now and gave the recipe to my daughter who has a little girl with allergies. Thanks for all your sharing. 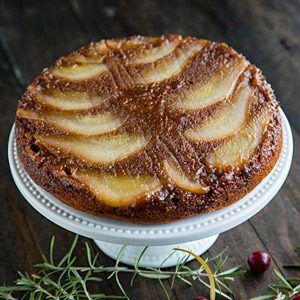 And I will be making the pear cake over Christmas. Sandi. This might be my new favorite cake! I made it as a last-minute dessert last night, and we finished it for breakfast this morning. It’s not too sweet, and it was totally forgiving of me not having as much maple syrup as I thought I had. (I dissolved some brown sugar in water to make up the difference, and it was totally fine.) The spiciness is really nice and perfect for winter, and the slight crunch of the pears adds a pleasant bit of texture. It’s wonderfully moist, with a deliciously sticky top. It turns out pears shrink a LOT when cooked, so I may pack more on the bottom/top next time, I’ve made many of your recipes over the years, Susan (although I only made the complete switch to vegan a few months ago), and I haven’t been disappointed yet. This is another excellent recipe, thank you! Thank you for such a detailed review! I’m so happy you liked it!